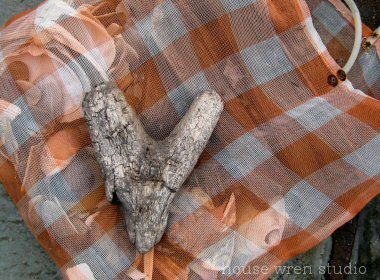 A few Februarys ago, I did a series of posts I called Pieces of Heart. They were snapshots of sentimental hearts and found images mostly discovered around the house. It surprised me that there were so many. Once I started looking, they seemed to be everywhere. This image is from our trip to Cartagena in March 07. 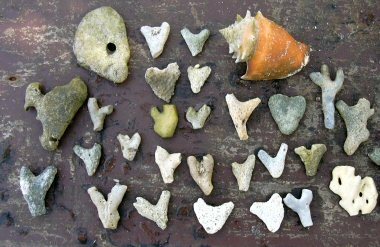 The heart-shaped shards of coral were found in the sand on a small island we visited. I hate to think what made them break off. I collected these that day and laid them out onto a table in the sand. One of the local women left her beadwork under a tree and came over to see what I was up to. There was a moment when we both saw the same possibilities. Without a common language, we gestured and held them up like ornaments on an imagined necklace, admiring each other's choices. She walked away and returned to her work. I wondered if she would scavenge those pieces another day and make necklaces to sell to tourists like me. I left some there and took some home. Looking at the photo now I can't help but also think of the women in Haiti. Rebecca's friends and countless others who have lost everything. What they would give for the income, peace and pleasure of craft. Rebecca is launching an art auction for Haiti. It begins today and some of us are contributing to that as well as to the Etsy shop she opened for her Haitian community. Yesterday she put out a call for embroidery threads for her friend, Jeannine, whose work will be auctioned in the first round. Is that something you could do? Clean out or shop for Jeannine? Check here for auction info. Last fall I started House Wren Studio Sessions, craft classes held here in Irvington at my friend Jane's house. On Saturday, fourteen of the loveliest, sweetest art girls came from near and far to enjoy each other's company and indulge their creative spirits. Something like a Craft Spa with lunch catered by my talented friend, Suzanne. With Valentine's Day approaching, the theme for this workshop was Sweater Craft. Ready and waiting were approximately 40 felted sweaters to be deconstructed and upcycled into a selection of projects. Reds, pinks, whites and a few orange ones for spice. My welcome coffee cozies for each student. Filled with snippets and surprises from my stash. Number tapes from Papier Valise (which came in handy as inventive nametags). Placesetting tins full of extras from the sponsors. Fabulous hooked circle pins from my wonderful friend, Mary Stanley. Trophy tags from Denise Sharp. One of her extraordinary glittered heart boxes for a door prize. A lovely banner from Kas sent in honor of her own birthday! It opened to spell- love, sweet, love. Noodle and Lou's door prize, an adorable handpainted doll. A vintage hanky pillow from Primrose Designs. A basket of trims and accessories from Tinsel Trading. A few extra door prizes from my studio, too. Valentine-y gifts from the girls for each other. Favorite materials unpacked and ready to go. beautiful, colorful heaps of scraps and trims. Roxy joined us to snoop and then found her own spot in the scene. complete with Red Velvet cupcakes- devoured in a heartbeat! We enjoyed a quick tour of her gorgeous home and returned to Jane's to finish up. Even the drifted scraps left behind were heartwarming. It was just that kind of a day. There was a moment when I looked around and saw the newly formed community of happy faces, laughing, telling stories, working, teaching, sharing everything so freely and I realized that the overall enjoyment of spirit counted for the biggest success. Relaxing and being together with each other's kindness, creativity and comfort made for a very special day. And yes, we had fun making lots of crafts too. I'm getting ready for our class tomorrow. A day filled with creative craft, good food and friends. O, I'm so excited! And thanks so very much for snapping up my donations and supporting Rebecca's relief project in Haiti.